Whether you smoke joints or cigarettes, the disturbed feeling of someone eyeing you with disgust may be a common feeling. Sometimes, it is simply illegal or not allowed to smoke in certain private areas. Sometimes, you have no intention of being a nuisance or want to disturb others, you simply need a real smoke. Now there’s a surprising way to get around that, even when it means smoking a real joint or cigarette. While these days you can replace your smoking habit with electronic cigarettes and vaporizers, some people are weary about other health risks associated with electronic administration, while others just want to have a good old fashioned smoke without offending others. 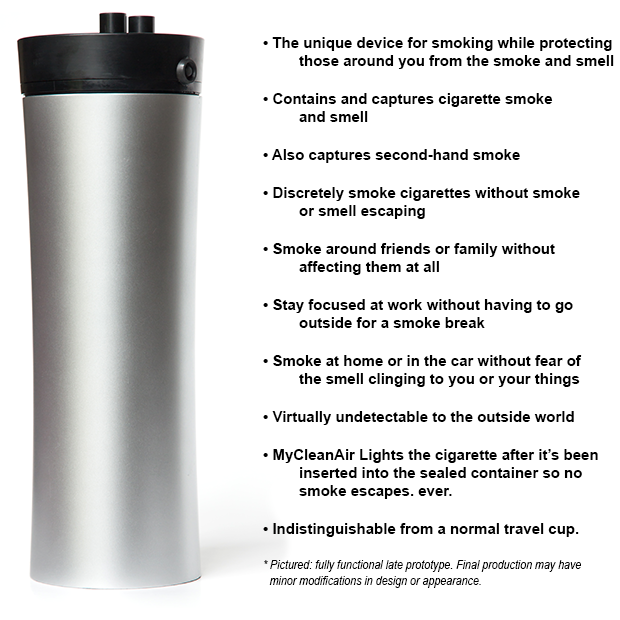 Introducing, MyCleanAir, a device which appears to look like a travel cup, but secretly enables smokers to do so without the smoke escaping and disturbing the people or and environment around them. No vaporizing, it’s for real smoke, joints, and cigarettes! The design is pretty amazing. The cigarette or joint stays inside the chamber and empties into an ash tray as usual. 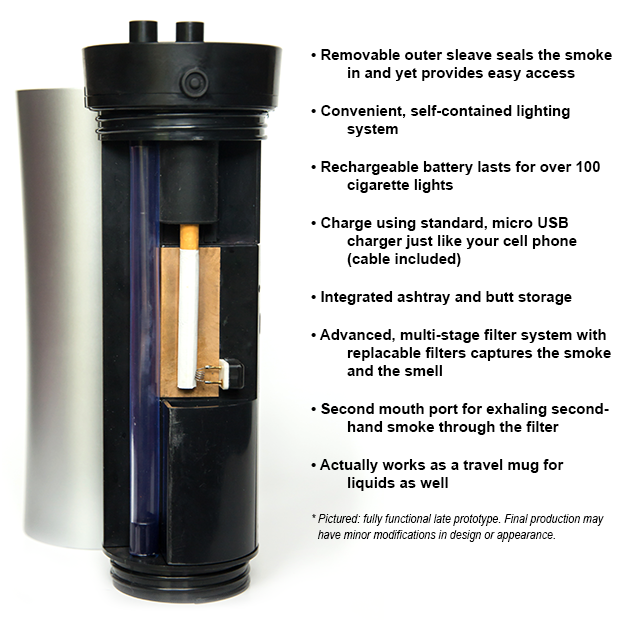 There is an ignitor, head shield, filter and exhale tube that all work together to keep smoke and the contents within the device. All odor and waste is kept within the unique device! What’s even more interesting is that while it looks like a travel mug, it can actually work as one, for liquids! 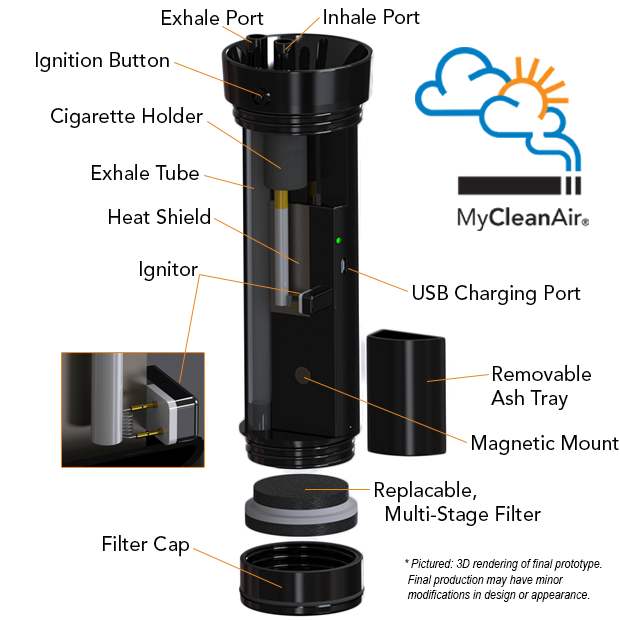 MyCleanAir is making it’s appearance on Indiegogo as a crowd funded project and will take a few more months to a year to complete. The first people to make an investment in the campaign can get one for as low as $50. We think this is a great invention. It takes smoke deodorizers to another level, and better yet, you can use it with any cigarette or joint super discreetly. The travel cup look makes it completely undetectable. We hope it works well and wish its creators the best of luck. New chocolate candy mold identifies THC laced edibles.